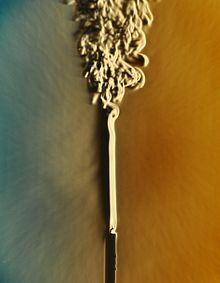 The plume from this candle flame goes from laminar to turbulent. The Reynolds number can be used to predict where this transition will take place. A vortex street around a cylinder. This can occur around cylinders and spheres, for any fluid, cylinder size and fluid speed, provided that it has a Reynolds number between roughly 40 and 1000. Sir George Stokes introduced Reynolds numbers. Osborne Reynolds popularised the concept. The Reynolds number (Re) is an important dimensionless quantity in fluid mechanics used to help predict flow patterns in different fluid flow situations. At low Reynolds numbers, flows tend to be dominated by laminar (sheet-like) flow, while at high Reynolds numbers turbulence results from differences in the fluid's speed and direction, which may sometimes intersect or even move counter to the overall direction of the flow (eddy currents). These eddy currents begin to churn the flow, using up energy in the process, which for liquids increases the chances of cavitation. The Reynolds number has wide applications, ranging from liquid flow in a pipe to the passage of air over an aircraft wing. It is used to predict the transition from laminar to turbulent flow, and is used in the scaling of similar but different-sized flow situations, such as between an aircraft model in a wind tunnel and the full size version. The predictions of the onset of turbulence and the ability to calculate scaling effects can be used to help predict fluid behaviour on a larger scale, such as in local or global air or water movement and thereby the associated meteorological and climatological effects. The concept was introduced by Sir George Stokes in 1851, but the Reynolds number was named by Arnold Sommerfeld in 1908 after Osborne Reynolds (1842–1912), who popularized its use in 1883. The Reynolds number is the ratio of inertial forces to viscous forces within a fluid which is subjected to relative internal movement due to different fluid velocities, which is known as a boundary layer in the case of a bounding surface such as the interior of a pipe. A similar effect is created by the introduction of a stream of high-velocity fluid into a low-velocity fluid, such as the hot gases emitted from a flame in air. This relative movement generates fluid friction, which is a factor in developing turbulent flow. Counteracting this effect is the viscosity of the fluid, which tends to inhibit turbulence. The Reynolds number quantifies the relative importance of these two types of forces for given flow conditions, and is a guide to when turbulent flow will occur in a particular situation. This ability to predict the onset of turbulent flow is an important design tool for equipment such as piping systems or aircraft wings, but the Reynolds number is also used in scaling of fluid dynamics problems, and is used to determine dynamic similitude between two different cases of fluid flow, such as between a model aircraft, and its full-size version. Such scaling is not linear and the application of Reynolds numbers to both situations allows scaling factors to be developed. ν is the kinematic viscosity of the fluid (m2/s). The Reynolds number can be defined for several different situations where a fluid is in relative motion to a surface. [n 1] These definitions generally include the fluid properties of density and viscosity, plus a velocity and a characteristic length or characteristic dimension (L in the above equation). This dimension is a matter of convention – for example radius and diameter are equally valid to describe spheres or circles, but one is chosen by convention. For aircraft or ships, the length or width can be used. For flow in a pipe, or for a sphere moving in a fluid, the internal diameter is generally used today. Other shapes such as rectangular pipes or non-spherical objects have an equivalent diameter defined. For fluids of variable density such as compressible gases or fluids of variable viscosity such as non-Newtonian fluids, special rules apply. The velocity may also be a matter of convention in some circumstances, notably stirred vessels. In practice, matching the Reynolds number is not on its own sufficient to guarantee similitude. Fluid flow is generally chaotic, and very small changes to shape and surface roughness of bounding surfaces can result in very different flows. Nevertheless, Reynolds numbers are a very important guide and are widely used. 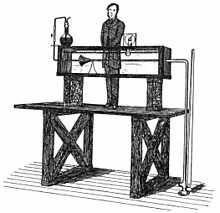 Osborne Reynolds' apparatus of 1883 demonstrating the onset of turbulent flow. The apparatus is still at the University of Manchester. 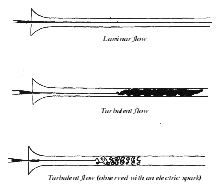 Diagram from Reynolds' 1883 paper showing onset of turbulent flow. Osborne Reynolds famously studied the conditions in which the flow of fluid in pipes transitioned from laminar flow to turbulent flow. In his 1883 paper Reynolds described the transition from laminar to turbulent flow in a classic experiment in which he examined the behaviour of water flow under different flow velocities using a small stream of dyed water introduced into the centre of clear water flow in a larger pipe. The larger pipe was glass so the behaviour of the layer of the dyed stream could be observed, and at the end of this pipe there was a flow control valve used to vary the water velocity inside the tube. When the velocity was low, the dyed layer remained distinct through the entire length of the large tube. When the velocity was increased, the layer broke up at a given point and diffused throughout the fluid's cross-section. The point at which this happened was the transition point from laminar to turbulent flow. From these experiments came the dimensionless Reynolds number for dynamic similarity—the ratio of inertial forces to viscous forces. Reynolds also proposed what is now known as the Reynolds-averaging of turbulent flows, where quantities such as velocity are expressed as the sum of mean and fluctuating components. Such averaging allows for 'bulk' description of turbulent flow, for example using the Reynolds-averaged Navier–Stokes equations. is the density of the fluid (kg/m3). ρ is the density of the fluid (kg/m3). where A is the cross-sectional area, and P is the wetted perimeter. The wetted perimeter for a channel is the total perimeter of all channel walls that are in contact with the flow. This means that the length of the channel exposed to air is not included in the wetted perimeter. Di is the outside diameter of the inner pipe. For calculation involving flow in non-circular ducts, the hydraulic diameter can be substituted for the diameter of a circular duct, with reasonable accuracy, if the aspect ratio AR of the duct cross-section remains in the range 1/4 < AR < 4. In boundary layer flow over a flat plate, experiments confirm that, after a certain length of flow, a laminar boundary layer will become unstable and turbulent. This instability occurs across different scales and with different fluids, usually when Rex ≈ 7005500000000000000♠5×105, where x is the distance from the leading edge of the flat plate, and the flow velocity is the freestream velocity of the fluid outside the boundary layer. For flow in a pipe of diameter D, experimental observations show that for "fully developed" flow,[n 2] laminar flow occurs when ReD < 2300 and turbulent flow occurs when ReD > 2900. At the lower end of this range, a continuous turbulent-flow will form, but only at a very long distance from the inlet of the pipe. The flow in between will begin to transition from laminar to turbulent and then back to laminar at irregular intervals, called intermittent flow. This is due to the different speeds and conditions of the fluid in different areas of the pipe's cross-section, depending on other factors such as pipe roughness and flow uniformity. Laminar flow tends to dominate in the fast-moving center of the pipe while slower-moving turbulent flow dominates near the wall. As the Reynolds number increases, the continuous turbulent-flow moves closer to the inlet and the intermittency in between increases, until the flow becomes fully turbulent at ReD > 2900. This result is generalized to non-circular channels using the hydraulic diameter, allowing a transition Reynolds number to be calculated for other shapes of channel. These transition Reynolds numbers are also called critical Reynolds numbers, and were studied by Osborne Reynolds around 1895. The critical Reynolds number is different for every geometry. For a fluid moving between two plane parallel surfaces—where the width is much greater than the space between the plates—then the characteristic dimension is equal to twice the distance between the plates. This is consistent with the annular duct and rectangular duct cases above taken to a limiting aspect ratio. For flow of liquid with a free surface, the hydraulic radius must be determined. This is the cross-sectional area of the channel divided by the wetted perimeter. For a semi-circular channel, it is quarter the diameter (in case of full pipe flow). For a rectangular channel, the hydraulic radius is the cross-sectional area divided by the wetted perimeter. Some texts then use a characteristic dimension that is four times the hydraulic radius, chosen because it gives the same value of Re for the onset of turbulence as in pipe flow, while others use the hydraulic radius as the characteristic length-scale with consequently different values of Re for transition and turbulent flow. Reynolds numbers are used in airfoil design to (among other things) manage "scale effect" when computing/comparing characteristics (a tiny wing, scaled to be huge, will perform differently). Fluid dynamicists define the chord Reynolds number R like this: R = Vc/ν, where V is the flight speed, c is the chord length, and ν is the kinematic viscosity of the fluid in which the airfoil operates, which is 6995146000000000000♠1.460×10−5 m2/s for the atmosphere at sea level. In some special studies a characteristic length other than chord may be used; rare is the "span Reynolds number", which is not to be confused with spanwise stations on a wing, where chord is still used. The Reynolds number for an object moving in a fluid, called the particle Reynolds number and often denoted Rep, characterizes the nature of the surrounding flow and its fall velocity. 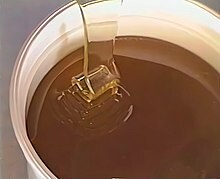 The high viscosity of honey results in perfectly laminar flow when poured from a bucket, while the low surface tension allows it to remain sheet-like even after reaching the fluid below. Analogous to turbulence, when the flow meets resistance it slows and begins oscillating back and forth, piling upon itself. Creeping flow past a falling sphere: streamlines, drag force Fd and force by gravity Fg. Where the viscosity is naturally high, such as polymer solutions and polymer melts, flow is normally laminar. The Reynolds number is very small and Stokes' Law can be used to measure the viscosity of the fluid. Spheres are allowed to fall through the fluid and they reach the terminal velocity quickly, from which the viscosity can be determined. The laminar flow of polymer solutions is exploited by animals such as fish and dolphins, who exude viscous solutions from their skin to aid flow over their bodies while swimming. It has been used in yacht racing by owners who want to gain a speed advantage by pumping a polymer solution such as low molecular weight polyoxyethylene in water, over the wetted surface of the hull. It is, however, a problem for mixing of polymers, because turbulence is needed to distribute fine filler (for example) through the material. Inventions such as the "cavity transfer mixer" have been developed to produce multiple folds into a moving melt so as to improve mixing efficiency. The device can be fitted onto extruders to aid mixing. 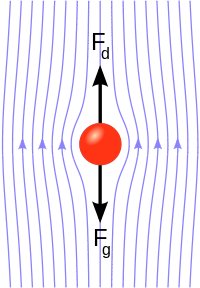 For a sphere in a fluid, the characteristic length-scale is the diameter of the sphere and the characteristic velocity is that of the sphere relative to the fluid some distance away from the sphere, such that the motion of the sphere does not disturb that reference parcel of fluid. The density and viscosity are those belonging to the fluid. Note that purely laminar flow only exists up to Re = 10 under this definition. Under the condition of low Re, the relationship between force and speed of motion is given by Stokes' law. The equation for a rectangular object is identical to that of a sphere, with the object being approximated as an ellipsoid and the axis of length being chosen as the characteristic length scale. Such considerations are important in natural streams, for example, where there are few perfectly spherical grains. For grains in which measurement of each axis is impractical, sieve diameters are used instead as the characteristic particle length-scale. Both approximations alter the values of the critical Reynolds number. The particle Reynolds number is important in determining the fall velocity of a particle. When the particle Reynolds number indicates laminar flow, Stokes' law can be used to calculate its fall velocity. When the particle Reynolds number indicates turbulent flow, a turbulent drag law must be constructed to model the appropriate settling velocity. The choice of equation depends on the system involved: the first is successful in correlating the data for various types of packed and fluidized beds, the second Reynolds number suits for the liquid-phase data, while the third was found successful in correlating the fluidized bed data, being first introduced for liquid fluidized bed system. Laminar conditions apply up to Re = 10, fully turbulent from Re = 2000. The system is fully turbulent for values of Re above 7004100000000000000♠10000. The Moody diagram, which describes the Darcy–Weisbach friction factor f as a function of the Reynolds number and relative pipe roughness. Pressure drops seen for fully developed flow of fluids through pipes can be predicted using the Moody diagram which plots the Darcy–Weisbach friction factor f against Reynolds number Re and relative roughness ε/D. The diagram clearly shows the laminar, transition, and turbulent flow regimes as Reynolds number increases. The nature of pipe flow is strongly dependent on whether the flow is laminar or turbulent. Qualitative behaviors of fluid flow over a cylinder depends to a large extent on Reynolds number; similar flow patterns often appear when the shape and Reynolds number is matched, although other parameters like surface roughness have a big effect. is full-scale Reynolds number, and similarly for the Euler numbers. This allows engineers to perform experiments with reduced scale models in water channels or wind tunnels and correlate the data to the actual flows, saving on costs during experimentation and on lab time. Note that true dynamic similitude may require matching other dimensionless numbers as well, such as the Mach number used in compressible flows, or the Froude number that governs open-channel flows. Some flows involve more dimensionless parameters than can be practically satisfied with the available apparatus and fluids, so one is forced to decide which parameters are most important. For experimental flow modeling to be useful, it requires a fair amount of experience and judgment of the engineer. An example where the mere Reynolds number is not sufficient for similarity of flows (or even the flow regime – laminar or turbulent) are bounded flows, i.e. flows that are restricted by walls or other boundaries. A classical example of this is the Taylor–Couette flow, where the dimensionless ratio of radii of bounding cylinders is also important, and many technical applications where these distinctions play an important role. Principles of these restrictions were developed by Maurice Marie Alfred Couette and Geoffrey Ingram Taylor and developed further by Floris Takens and David Ruelle. In a turbulent flow, there is a range of scales of the time-varying fluid motion. The size of the largest scales of fluid motion (sometimes called eddies) are set by the overall geometry of the flow. For instance, in an industrial smoke stack, the largest scales of fluid motion are as big as the diameter of the stack itself. The size of the smallest scales is set by the Reynolds number. As the Reynolds number increases, smaller and smaller scales of the flow are visible. In a smoke stack, the smoke may appear to have many very small velocity perturbations or eddies, in addition to large bulky eddies. In this sense, the Reynolds number is an indicator of the range of scales in the flow. The higher the Reynolds number, the greater the range of scales. The largest eddies will always be the same size; the smallest eddies are determined by the Reynolds number. What is the explanation for this phenomenon? A large Reynolds number indicates that viscous forces are not important at large scales of the flow. With a strong predominance of inertial forces over viscous forces, the largest scales of fluid motion are undamped—there is not enough viscosity to dissipate their motions. The kinetic energy must "cascade" from these large scales to progressively smaller scales until a level is reached for which the scale is small enough for viscosity to become important (that is, viscous forces become of the order of inertial ones). It is at these small scales where the dissipation of energy by viscous action finally takes place. The Reynolds number indicates at what scale this viscous dissipation occurs. Poiseuille's law on blood circulation in the body is dependent on laminar flow. In turbulent flow the flow rate is proportional to the square root of the pressure gradient, as opposed to its direct proportionality to pressure gradient in laminar flow. Using the definition of the Reynolds number we can see that a large diameter with rapid flow, where the density of the blood is high, tends towards turbulence. Rapid changes in vessel diameter may lead to turbulent flow, for instance when a narrower vessel widens to a larger one. Furthermore, a bulge of atheroma may be the cause of turbulent flow, where audible turbulence may be detected with a stethoscope. Reynolds number interpretation has been extended into the area of arbitrary complex systems. Such as financial flows, nonlinear networks, etc. In the latter case an artificial viscosity is reduced to nonlinear mechanism of energy distribution in complex network media. Reynolds number then represents a basic control parameter which expresses a balance between injected and dissipated energy flows for open boundary system. It has been shown  that Reynolds critical regime separates two types of phase space motion: accelerator (attractor) and decelerator. High Reynolds number leads to a chaotic regime transition only in frame of strange attractor model. ρ is the fluid density (kg/m3). where the term μ/ρLV = 1/Re. This is why mathematically all Newtonian, incompressible flows with the same Reynolds number are comparable. Notice also that in the above equation, the viscous terms vanish for Re → ∞. Thus flows with high Reynolds numbers are approximately inviscid in the free stream. There are many dimensionless numbers in fluid mechanics. 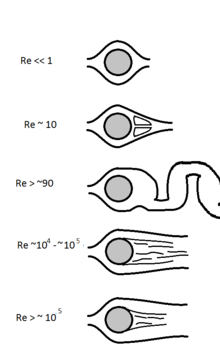 The Reynolds number measures the ratio of advection and diffusion effects on structures in the velocity field, and is therefore closely related to Péclet numbers, which measure the ratio of these effects on other fields carried by the flow, for example temperature and magnetic fields. Replacement of the kinematic viscosity ν = μ/ρ in Re by the thermal or magnetic diffusivity results in respectively the thermal Péclet number and the magnetic Reynolds number. These are therefore related to Re by products with ratios of diffusivities, namely the Prandtl number and magnetic Prandtl number. ^ The definition of the Reynolds number is not to be confused with the Reynolds equation or lubrication equation. ^ Full development of the flow occurs as the flow enters the pipe, the boundary layer thickens and then stabilizes after several diameters distance into the pipe. ^ Tansley, Claire E.; Marshall, David P. (2001). "Flow past a Cylinder on a Plane, with Application to Gulf Stream Separation and the Antarctic Circumpolar Current" (PDF). Journal of Physical Oceanography. 31 (11): 3274–3283. Bibcode:2001JPO....31.3274T. doi:10.1175/1520-0485(2001)031<3274:FPACOA>2.0.CO;2. Archived from the original (PDF) on 2011-04-01. ^ Stokes, George (1851). "On the Effect of the Internal Friction of Fluids on the Motion of Pendulums". Transactions of the Cambridge Philosophical Society. 9: 8–106. Bibcode:1851TCaPS...9....8S. ^ Reynolds, Osborne (1883). "An experimental investigation of the circumstances which determine whether the motion of water shall be direct or sinuous, and of the law of resistance in parallel channels". Philosophical Transactions of the Royal Society. 174: 935–982. doi:10.1098/rstl.1883.0029. JSTOR 109431. ^ a b Rott, N. (1990). "Note on the history of the Reynolds number". Annual Review of Fluid Mechanics. 22 (1): 1–11. Bibcode:1990AnRFM..22....1R. doi:10.1146/annurev.fl.22.010190.000245. ^ Falkovich, G. (2011). Fluid Mechanics. Cambridge University Press. ^ Fox, R. W.; McDonald, A. T.; Pritchard, Phillip J. (2004). Introduction to Fluid Mechanics (6th ed.). Hoboken: John Wiley and Sons. p. 348. ISBN 978-0-471-20231-8. ^ Shih, Merle C. Potter, Michigan State University, David C. Wiggert, Michigan State University, Bassem Ramadan, Kettering University ; with Tom I-P. (2012). Mechanics of fluids (Fourth ed.). p. 105. ISBN 978-0-495-66773-5. ^ P. B. S. Lissaman (1983). "Low-Reynolds-Number Airfoils". Annu. Rev. Fluid Mech. 15 (15): 223–39. Bibcode:1983AnRFM..15..223L. CiteSeerX 10.1.1.506.1131. doi:10.1146/annurev.fl.15.010183.001255. ^ ISO. "International Standard Atmosphere". eng.cam.ac.uk. ^ Uwe Ehrenstein; Christophe Eloy. "Skin friction on a moving wall and its implications for swimming animals" (PDF). Archived from the original (PDF) on 10 December 2013. Retrieved 11 February 2014. ^ a b Rhodes, M. (1989). Introduction to Particle Technology. Wiley. ISBN 978-0-471-98482-5. ^ Dusenbery, David B. (2009). Living at Micro Scale. Cambridge, Massachusetts: Harvard University Press. p. 49. ISBN 978-0-674-03116-6. ^ a b Dwivedi, P. N. (1977). "Particle-fluid mass transfer in fixed and fluidized beds". Industrial & Engineering Chemistry Process Design and Development. 16 (2): 157–165. doi:10.1021/i260062a001. ^ Sinnott, R. K. Coulson & Richardson's Chemical Engineering, Volume 6: Chemical Engineering Design (4th ed.). Butterworth-Heinemann. p. 73. ISBN 978-0-7506-6538-4. ^ "Major Head Loss - Friction Loss". www.nuclear-power.net. Retrieved 2017-10-03. ^ "Laminar, transitional and turbulent flow". rheologic.net. ^ Manneville, Paul; Pomeau, Yves (25 March 2009). "Transition to turbulence". Scholarpedia. 4 (3): 2072. Bibcode:2009SchpJ...4.2072M. doi:10.4249/scholarpedia.2072. ^ Patel, V. C.; Rodi, W.; Scheuerer, G. (1985). "Turbulence Models for Near-Wall and Low Reynolds Number Flows—A Review". AIAA Journal. 23 (9): 1308–1319. Bibcode:1985AIAAJ..23.1308P. doi:10.2514/3.9086. ^ Dusenbery, David B. (2009). Living at Micro Scale. Cambridge, Massachusetts: Harvard University Press. p. 136. ISBN 9780674031166. ^ Los, C. (2003). Financial Market Risk: Measurement and Analysis. Routledge. ^ a b Kamenshchikov, Sergey (2013). "Extended Prigogine Theorem: Method for Universal Characterization of Complex System Evolution". Chaos and Complexity Letters. 8 (1): 63–71. Zagarola, M. V. and Smits, A. J., "Experiments in High Reynolds Number Turbulent Pipe Flow." AIAA paper #96-0654, 34th AIAA Aerospace Sciences Meeting, Reno, Nevada, January 15–18, 1996. Jermy M., "Fluid Mechanics A Course Reader," Mechanical Engineering Dept., University of Canterbury, 2005, pp. d5.10. Truskey, G. A., Yuan, F, Katz, D. F. (2004). Transport Phenomena in Biological Systems Prentice Hall, pp. 7. ISBN 0-13-042204-5. ISBN 978-0-13-042204-0. Wikimedia Commons has media related to Reynolds number. Reynolds mini-biography and picture of original apparatus at Manchester University.